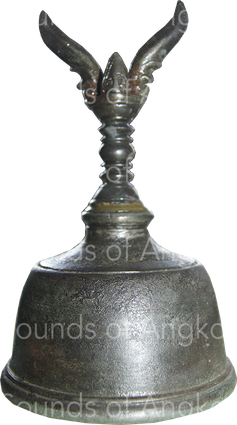 Human bells of 'open' - Site de soundsofangkor ! 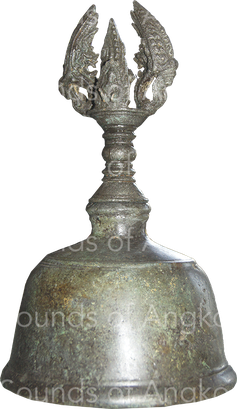 The iconography shows various types of bells of 'open' for differentiated uses: half-vajra bells with internal clapper for the worshipers, bells with external clapper, bells for domestic animals with internal clapper and, on the north gallery of Angkor Wat (12th century section), a large shoulder carried bell with external clapper. Two half vajra bells held by Brahmins. Angkor Wat, Historical Parade. 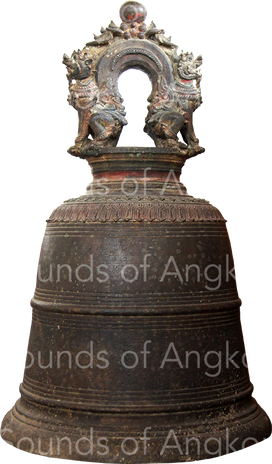 Among these instruments of power, there are, in the Angkorian period, bells surmounted by a half-vajra, the attribute of the god Indra. 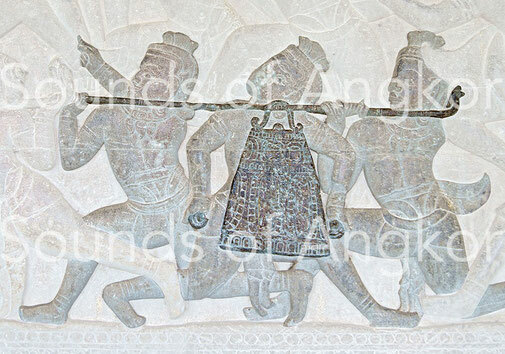 In Angkor Wat, in the Historical Parade bas-relief, preceding the litter of the Royal Priest, two Brahmins hold in their right hand a such bell. The Angkorian half vajra consists of five points arranged in a staggered arrangement, depicting the five peaks of Mount Meru described in the Hindu sacred texts. Of profile, only three of the five points are visible. They symbolize the Hindu Trimurti: Brahma, Viṣṇu, Śiva. Another representation of a pair of vajra lightning bells is visible in the southwest corner of this same temple, still in the hands of the Brahmins. Six ascetics in the forest. In the center one of them holds a rosary still in use in Cambodia. Two others hold half vajra bells. Angkor Wat, south-west corner. There are two other representations of ritual bells, one in Bayon, very eroded, the other on a bas-relief in Bayon style at the National Museum of Cambodia. In both cases, the bell without vajra is held with the left hand. Ascetic in the forest with hand bell. Fragment of pediment. Bayon style. Sandstone. National Museum of Cambodia. Archaeological excavations have provided many half vajra bells or with handles ornamented of other motifs. These bells are all made in three parts: the handle, the waist and the clapper. 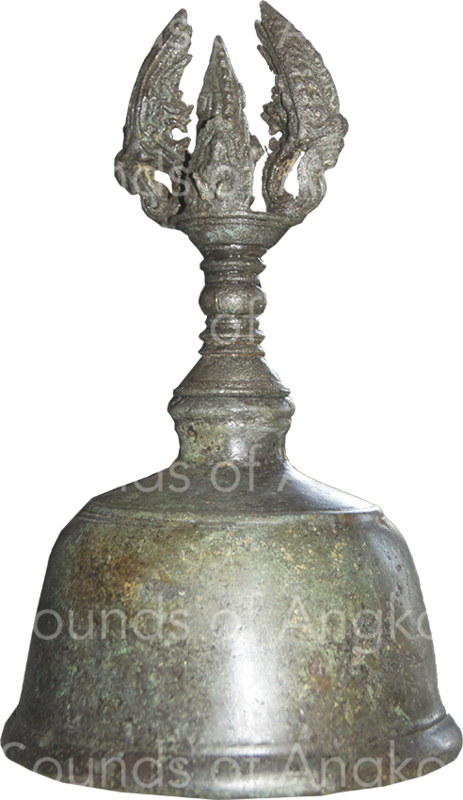 Bronze Angkorian half vajra bell. Wat Bo collection, Siem Reap. Bronze bell. Unknown period. National Museum of Cambodia. The epigraphy of Cambodia mentions the term bell in Sanskrit, ghaṇṭā, whose root has been preserved in the languages of India and in modern Khmer. 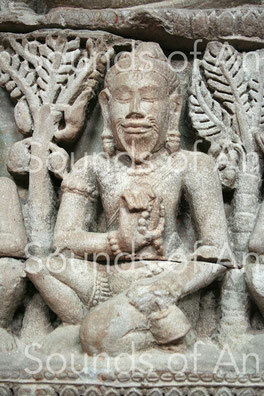 An occurrence of the 10th century*, in Old Khmer, cites the term katyāṅ and another of the 12th century**, kantiṅ. In the 10th century, the Sanskrit inscription of Prea Ngouk*** mentions the donation to the temple of a pair of silver bells. 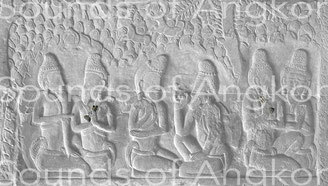 A single large bell with external clapper is depicted on the bas-reliefs of the north gallery of Angkor Wat (12th century). Its weight seems considerable considering the position of the two carriers. It is decorated. The percussionist holds a clapper in each hand. Large bell with external percussion on bearing. Angkor Wat, Battle of Asura and Deva. Contemporary bronze bell (chuong). Cambodia.